Copyright © 2004 by Roy Hempley, All rights reserved. (2) “Play It Again, Mr. Bach”, September 25, 2002, Roy Hempley and Doug Lehrer. (3) “The Big Parade”, Raphael Osheroff and Robert Zinko, undated. This is Part One of an article about Bach’s bugles. It discusses his early bugles, which were made when he thought he could make some money producing them. Part Two features some special bugles he made later in his career for the United States Army Band. Bach was both an engineer and a musician, but he had to learn to be a businessman. After trying his hand at bugle making for awhile, he began to complain about a basic problem. Nobody wanted to pay a lot of money for them. Bach’s normal business approach was to make high quality instruments and sell them at a price higher than that of his competitors. He found that musicians were willing to pay for quality. Instead of following that business strategy in the bugle market, Bach tried a middle-of-the-road approach. He did not offer Stradivarius Model bugles, choosing less expensive construction instead. His prices were not low enough, however, to match those of his competitors. With this “in-between” strategy, he did not sell many bugles. Bach began producing instruments in 1924, which was only five years after the close of World War I. Military-style bugles from that period were a little more far ranging in design than the standard Bb ceremonial bugles used today. First, there were the so-called regulation bugles, which were first defined by the military in the 19th Century. Most of these bugles were pitched in G, and by pulling out the tuning slide, in F. The military also used signal bugles. These were pitched higher, in Bb, and were designed to be used on battlefields. They were coiled tightly so they could be carried in a small pouch. Bach is reported to have been in charge of an Army bugle school during World War I (Reference 2), so he understood military requirements. The potential market for bugles increased after World War I as the demand for other kinds of bugles grew rapidly. Veterans turned in droves to fraternal organizations such as the American Legion. There was an explosion of drum and bugle corps sponsored by these groups. The corps needed bugles. As Bach entered the instrument business, the bugles used in drum and bugle corps were beginning to evolve into evermore-complex instruments. The corps wanted bugles that played in different octaves and keys. The use of crooks became commonplace. Valves began to appear, although their use was delayed for awhile by rules committees adjudicating competitions. The music and field presentations became more spectacular, and the competitions became very popular. (Reference 3) As the demand for bugles grew, Bach recognized that money might be made on this front as well. Many companies made bugles, and they sold an increasing variety of them. 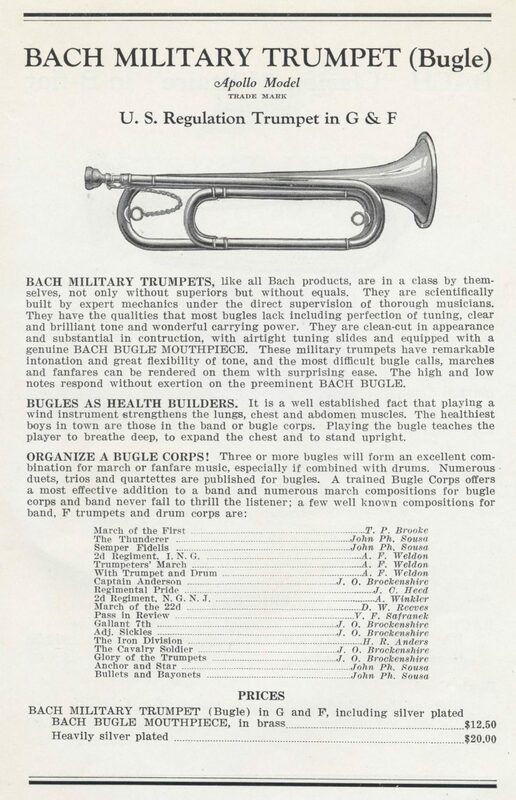 Despite the obvious competition, by the time Bach published his first instruments catalog, he clearly intended to market bugles for both military and drum and bugle corps use. This is evident in a page from a 1925/6 Bach instrument catalog (see below). Bach called his bugles military trumpets. He thought that this was necessary to avoid confusing them with European bugles, which were actually fluegelhorns. In addition to bugles, Bach’s first catalog offered a wide range of instruments in multiple keys. He also offered three different models: Stradivarius, Apollo and Mercury. This expanse of instruments raises some questions. Did Bach have some of each of these instruments on hand when he published his catalog? Did he make prototypes beforehand to ensure that he could in fact make all of them? While the answers to those questions are incomplete, things are a little clearer in the case of his bugles. With no immediate orders in hand, it appears that he did not make any bugles right away. He may have assumed that if you could make trumpets and cornets you could make bugles. Nonetheless, he knew how much he was going to charge for them as they had a price in his catalog. Exactly when did Bach make his first bugles? There is no record of the date, even an approximate one. Moreover, his early production numbers cannot be determined from the shop cards (Reference 1) despite their accuracy for other types of instruments. Similarly, the lowest serial number for a bugle that actually made it into the public domain one way or another is unknown. Here are some facts and comments to help explain the situation. The lowest range of serial numbers that might have been assigned to bugles begins with serial number 350. That particular shop card is missing from Bach’s files. In examining the cards above that number, it is possible to conclude that the next 94 numbers also might have been assigned to bugles, as the next serial number that clearly was not is #445.Â There are some surprising cases to consider between those extremes. 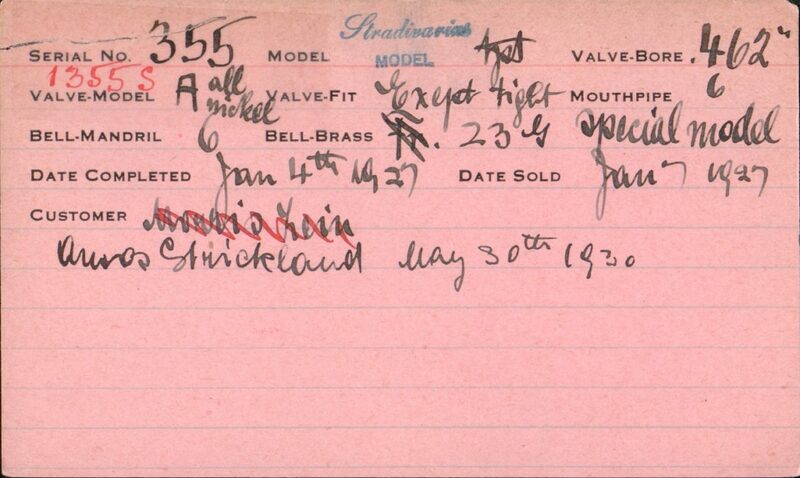 The first shop card whose serial number was clearly intended for a bugle is #351. That shop card is shown below. 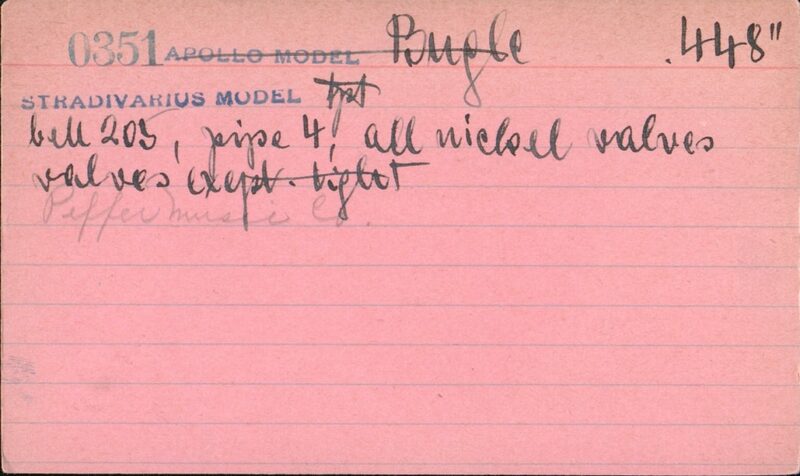 It is obvious that this card represents a trumpet although the serial number originally was going to be assigned to an Apollo bugle. At this point, readers might conclude that bugle #351 was not made at all. Shop cards #350 through #363 are interesting, but they shed little light on the numbers of bugles made. Three of the 14 cards; #350, #352 and #363; are missing from the files. The remaining 11 cards are in two formats. Seven of those are in the format shown for #351. All of these seven cards indicate that the serial numbers were intended for bugles but were eventually assigned to other instruments. The remaining four cards are in a newer, more comprehensive format. They are replacement cards that Bach routinely used in later production. None of these cards indicates that their serial numbers were ever intended for bugles. Based on those observations, the authors assumed for a while that none of the 14 serial numbers in question were assigned to bugles that were actually made. Then the unexpected happened, as it often does. One of the authors met Michael Corrigan, the owner of an Apollo bugle with serial number 355. The existence of bugle #355 proved the authors’ assumption false. Bugle #355 has the lowest serial number of any bugle that has been located so far. The authors were anxious to see what the shop card for bugle #355 had to say. That card turned out to be in the newer format (see below). Taking this new piece of evidence into account, the authors believe that most if not all of the 14 serial numbers in question originally were intended for bugles but were eventually assigned to other instruments. They cannot tell how many bugles were made and assigned serial numbers from among the fourteen. The very next card in the files, #364, is also interesting but for other reasons. It indicates that serial number 364 was assigned to an Apollo bugle. It is the only card the authors found that clearly indicates its serial number was assigned to a bugle and no other instrument. The card has the name Goldman on it. Was this a bugle made for Edwin Franko Goldman? If so, Bach would want to keep a record of it, possibly in the form of card #364. Shop cards #365 through #444 are missing from Bach’s files. These numbers represent 80 additional serial numbers.Â At this point, the authors only note that at least some of them were associated with actual bugles.Â Bach gave at least five bugles to children in his family. Two of those are featured in this article, and they have serial numbers within that range. There is one other point to add. The authors frequently are contacted about New York Bach instruments. They cannot remember ever having been contacted about a non-bugle instrument in the serial number range from #365 through #444. The authors suspect that those serial numbers were never assigned to instruments other than bugles. That does not mean, however, that Bach actually made bugles for all of those serial numbers. In summary, there appears to be 95 early serial numbers that might have been assigned to bugles, but the authors cannot tell how many bugles were actually made. While some bugles apparently were sold, others clearly were made and not sold (see below). The two bugles with serial numbers within the range of missing shop cards came to the authors’ attention in 2003 in a delightful way. At a dinner with Hans Bach’s son and his family, one of Hans’ granddaughters arrived gingerly carrying bugles #367 and #437 in a basket.Â (Hans Bach was Vincent Bach’s brother.) Readers should note that the serial numbers of these bugles essentially spanned the range of missing shop card numbers discussed above. A picture of bugle #367 is shown below. This bugle is very much like the bugle shown in Bach’s early catalog. It is an Apollo Model pitched in G/F.Â It was priced at $12.50 per that catalog. That is exactly 10 percent of the cost of a Bach Stradivarius trumpet from the same year, but its price is higher than the prices of some competitors’ prices. The authors do not know when bugle #367 was made. The lacquer appears to be original.Â If so, that would mean that it probably was made in the late 1920s when Bach began offering lacquer finishes. Bugle #367 has some features worth noting. 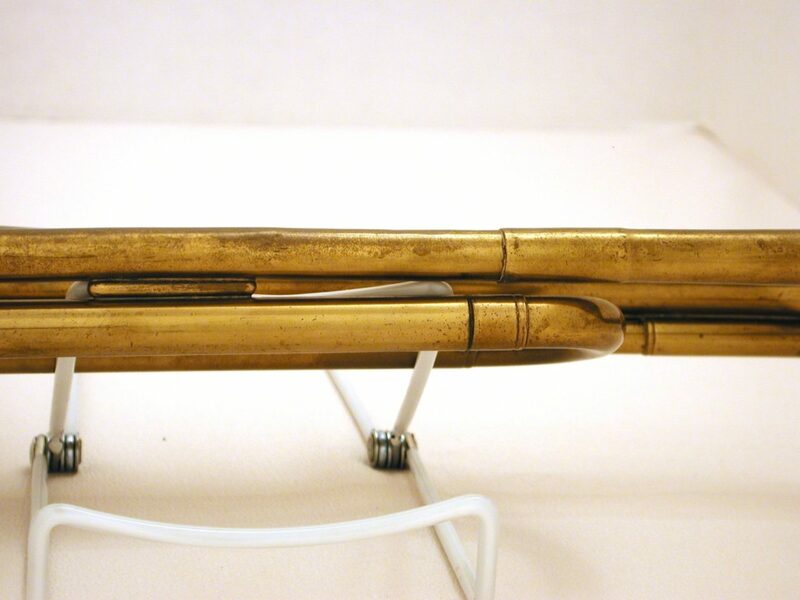 As with all Apollo instruments from that era, the mouthpiece receiver is not the familiar hexagonal receiver found on Stradivarius instruments. The receiver is made of comparatively lightweight material and can split more easily. The receiver may be designed to accept special bugle mouthpieces. So far, the only mouthpieces that appear to fit it are a very old Bach cornet mouthpiece and a modern flueglehorn mouthpiece. The authors cannot at this point say exactly what kind of mouthpiece Bach intended for it. Given that Bach is known to have made bugle mouthpieces for Army buglers during World War I, it may that the mouthpiece receiver on bugle #367 is designed specifically for Bach bugle mouthpieces. The bugle is light. It weighs almost exactly one pound. Unfortunately, the authors have no means to determine anything about either its bell and mouthpipe numbers or its bore size. The tuning slide is stuck, and the authors would not risk damaging it by having the tuning slide pulled just to check its bore size. Michael Corrigan, the owner of bugle #355 discussed above, lent his bugle to the authors. As its tuning slide is not frozen, the authors were able to measure its bore size. Bugle #355 measures 0.462 inches at the tuning slide, so the authors assume that bugle #367 would measure the same. Since the authors chose not to have the tuning slide of bugle #355 pulled, they did not know what markings were used to designate its position to play in F. The following is a picture of the marking from bugle #355. The tuning slide of bugle #355 is pulled out just beyond the scribe marks. The authors believe that the tuning slide of bugle #367 would be marked in the same way. 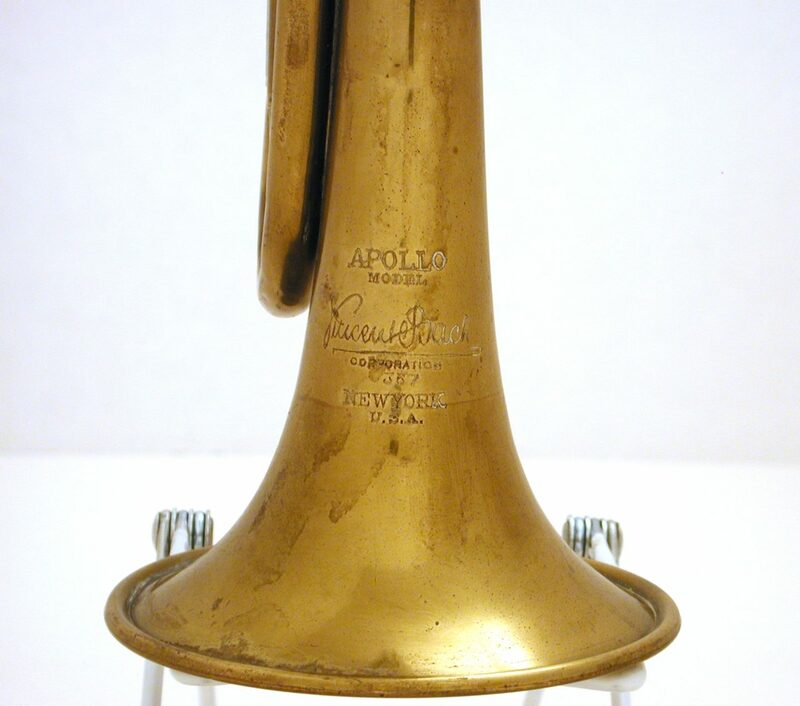 The bell stamping on bugle #367 confirms that it is an Apollo instrument. The serial number appears on the bell. There are two other interesting features to this bugle as noted in a photograph taken of the bottom of the bugle. The construction of #367 shows something of Bach’s thinking about reducing the costs of making bugles. First, he soldered a metal bar an inch and a half long between the lower-tuning-slide tube and the tubing that leads to the bell tail. This was simpler than using braces, which, in any case, would have been hard to fit. Another very interesting feature of this bugle is the manner in which the bell is joined to the tubing. This is illustrated in the above photograph as well. The bell tail is stretched, simply slid over the top of the tubing and soldered in place. This method eliminated the need for fitting the two pieces together with a sleeve. This connection would be easier to implement if the bell was unusually large in the tail section to begin with, but there are no means to check that because the bell mandril number is unknown. 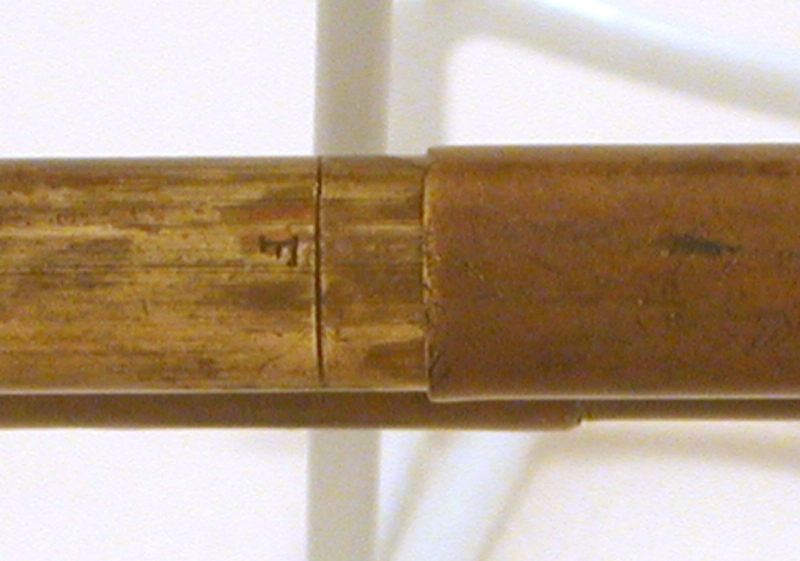 The upper-tuning-slide tube is connected to the mouthpipe by solder. This aspect of the construction is not shown. The mouthpipe of bugle #367 is soldered to the bell almost along its entire length (see below). While the authors think that this is not a desirable way to attach a bell to the mouthipipe, it does save production costs compared to using bell braces. The authors think that this and the other cost-saving features reduced manufacturing costs compared to Stradivarius instruments. Â The second bugle whose serial number is in the range of missing shop cards is #437. It is shown below. 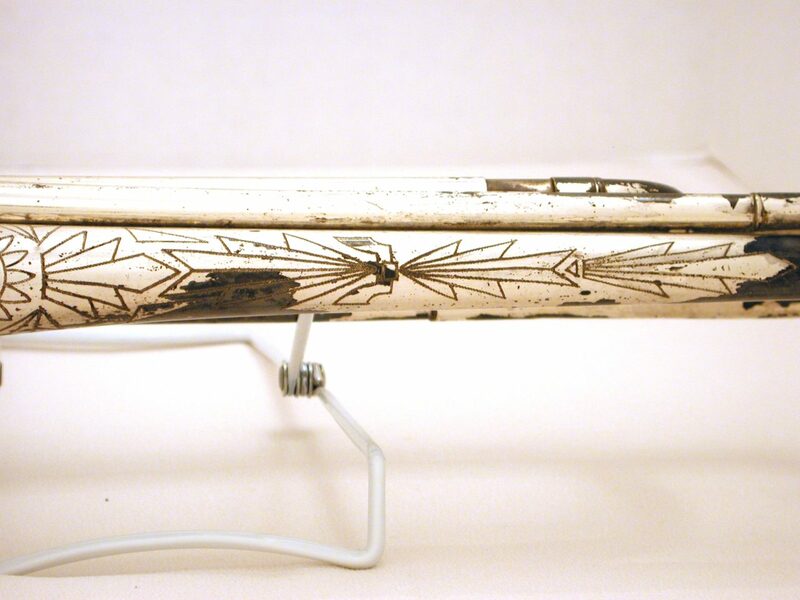 Â This bugle is silver plated and engraved.Â It is also lacquered, but the lacquer is worn in spots.Â Underneath those spots, the silver plating is tarnished. Bugle #437 is identical in every manufacturing respect to bugle #367.Â Bach made both bugles, but that was not at all clear to begin with.Â Bugle #437 caused some confusion on this point. The most intriguing aspect of this bugle is the bell. The bell has both machine stamping and engraving. The stamping is identical to that of bugle #367 described above. The engraving is confusing. First, it includes the name Champion. Champion is thought to be the name of a manufacturer that reportedly sold instruments through Lyon and Healy in the 1920s. This initially raised the speculation that bugle #437 may have been made by that company as well as the possibility that Bach had Champion make all of his bugles. The authors now reject that theory. 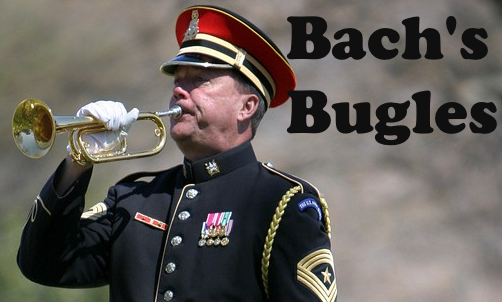 There are many similarities between bugles #367 and #437 and a bugle Bach made later in his career for the Army. The authors do not know why Champion was engraved on this bugle unless it was intended as a presentation instrument. From the engraving on the bell, it is obvious that this bugle was sold through Hans Bach. Vincent asked Hans to immigrate to the United States to help in the instrument business, and Hans did just that. He also sequentially owned two music stores in New York and offered a full line of music supplies and instruments. Among the more interesting remains from his store were remnants of violins that Hans had been making for sale as well as an assortment of other items. Store items still in the possession of members of Hans’ family are banjo strings, a range of mouthpieces and other typical items one might find in a music store catering to a full variety of musicians. While Hans sold Bach trumpets and cornets, he carried other brands as well. It may be that Hans convinced his brother Vincent, or vice versa, that Hans should be an outlet for Apollo bugles. If bugle #437 is any indication, some of them were to be very special. The above close-up of the engraving on bugle #437 is included in this article in the hopes that a reader might shed some light on it either from the standpoint of technique, template or engraver.Â The authors have done a limited amount of research on Bach bell engravings, but the engraving on bugle #437 is unlike any previously seen.Â The authors think that Hans probably arranged to have the engraving done and used someone other than Vincent’s engraver. Despite what seems to be low bugle sales, Bach did not give up on the idea of making them.Â In June 1932, one Dr. Max Shaweker, a medical doctor of Dover, Ohio, wrote to Bach asking him about some bugles for a drum and bugle corps.Â Dr. Shaweker’s letter is not in Bach’s files, but Bach’s reply of July 25, 1932 is. Bach explained that he had sent a large amount of literature to drum and bugle corps and that he had included a listing of available bugles without getting even one inquiry about them.Â Bach went on to say that he had a set of Bb bugles on hand that had bells on them made exactly the same way as the bells on Stradivarius trumpets.Â Each bell, he said, represented a value of $25, but Bach intended to sell the bugles below cost for $20.Â He indicated that he thought he could make a profit if he used two-piece bells and made a large quantity of instruments. Bach offered to make up samples of bugles for Dr. Shaweker, depending on Dr. Shaweker to tell him which keys were needed: Bb or G/F.Â He asked Dr. Shaweker to provide a sample of another manufacturer’s list of bugles.Â Bach wanted to mail advertising for new bugles, so he also asked Dr. Shaweker for a list of all of the drum and bugle corps in the United States as well as the names of their instructors.Â A marketing plan apparently was germinating in Bach’s mind. Bach was proactive in dealing with Dr. Shaweker and sent him some bugles.Â On December 8, 1932, Dr. Shaweker responded.Â Dr. Shaweker’s letter was four pages long.Â It described in the first place the great “tone quality and workmanship” of the Bach bugles he received.Â The rest of the letter, however, described their design deficiencies as Dr. Shaweker saw them.Â Unfortunately, he offered some descriptions that make a reader think that Bach was not knowledgeable about the bugle business from the drum and bugle corps perspective.Â Dr. Shaweker thought that Bach’s bugles were too short, too wide and configured in such a way that made them difficult to handle on the field.Â Â He went on to determine that the rings for the “silly chain” should be optional to save money and the water keys were “unsightly”.Â (This would be the standard water key that Bach used throughout his manufacturing career. )Â In the case of the latter, he even offered another design. Â Dr. Shaweker also sent Bach a King advertisement, which is still in Bach’s files.Â King made 11 types of bugles, not including the various keys they came in.Â They ranged in price from $6.50 to $42.50 in raw brass.Â The corresponding price range in silver with gold bell ranged from $14 to $57.50.Â The low ends of these price ranges represented G/F bugles similar to Bach’s bugles. Â These would be difficult goals for Bach to achieve. To show that Dr. Shaweker was not picking solely on Bach, the not-at-all-bashful Dr. Shaweker went on to describe what was wrong with King bugles as well. One might conclude from reading Dr. Shaweker’s letter that here was a real failure to communicate.Â Some of Dr. Shaweker’s comments were well meaning, intending to get Bach to make a bugle that would ease a bugler’s burden in competition.Â On the other hand, the fact that Bach’s bugles had fine tone quality, while mentioned, was left with relatively little attention.Â Bach indicated in other correspondence that he thought good tone production was the key to success in drum and bugle corps competitions.Â From this and his exchange with Dr. Shaweker, it would be easy to conclude that Bach never attended such a competition. There are no further records of correspondences between the two men.Â There are also no records of what happened to the bugles that Bach sent to Dr. Shaweker. 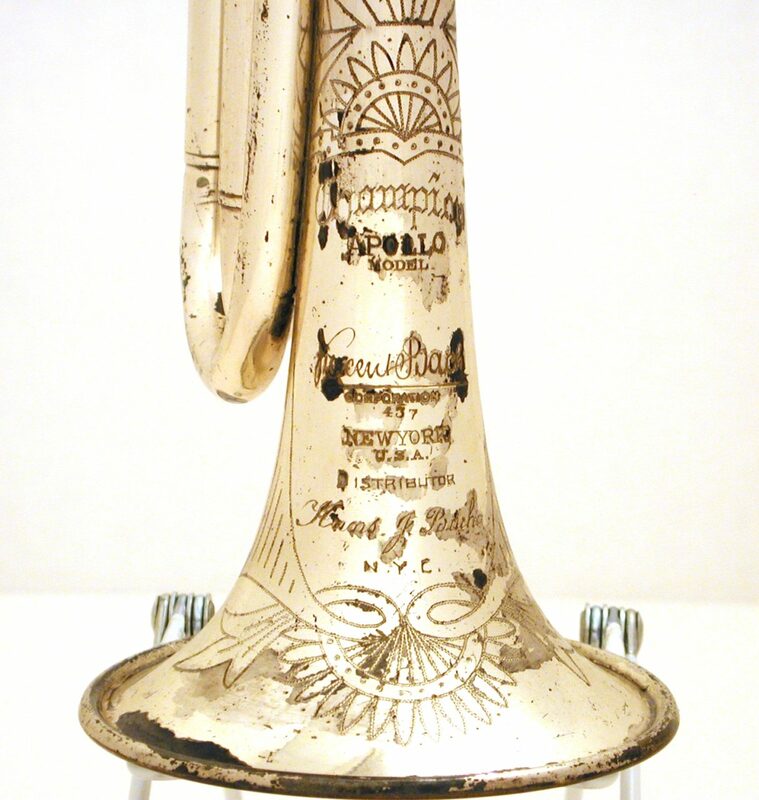 The available information on Bach’s bugles is scant after his correspondence with Dr. Shaweker in the early 1930s.Â Bach did leave sketches in his files of what he called a Deluxe American Legion Bugle.Â It was to be a Stradivarius design using a #7-10 bell (Reference 1) and a #6 mouthpipe.Â Based on the use of these components, it was probably designed around 1933/4.Â The authors think that these bugles were made too late to be the ones sent to Dr. Shaweker, if any were made at all.Â Other sketches indicate that Bach continued to think about bugle designs for some time.Â The authors do not know whether any of these bugles were produced or sold.Â Neither his American Legion bugles nor any other bugles are included in his 1940 catalog.Â It appears that at this point he did not intend to pursue bugle sales any further. The authors think Bach’s experience with bugles was discouraging.Â If nothing else, he probably realized that making bugles for drum and bugle corps was a little different than making trumpets.Â In particular, a limited line of regulation bugles was not going to be sufficient to attract customers.Â Moreover, making the wide range of bugles needed to penetrate the market would interrupt other production.Â Bach could make instruments of extraordinary quality, but high-quality bugles would cost too much.Â Low sales volume might well have meant selling them at a loss.Â If Bach had any commercial ideas about loss leaders and/or the value of good will, it is not evident to the authors, at least during this part of his manufacturing career. Two other Bach bugles were sold on Ebay in recent years.Â The authors believe that the first one is an Apollo bugle similar to the ones discussed above, but they lost track of it.Â The latest one (see below) is of more interest.Â It does not have a serial number, but it has some features that may indicate that either Bach or someone at the Bach factory continued to experiment with various bugle configurations. Â This bugle is pitched in Bb.Â Its central feature is a very narrow tuning slide.Â The tuning slide is quite similar to tuning slides found on early Bach Eb/D trumpets.Â The tuning slide tubes are very thin, consistent with Bach trumpets from before 1933.Â The tuning slide receivers closely match the dimensions of Bach’s post-1947 lightweight trumpets.Â The bend in the mouthpipe is unexpectedly uneven, presumably to accommodate the length of the mouthpipe.Â The Apollo mouthpiece receiver is designed to take a flugel horn mouthpiece, a feature shared with the early Apollo bugles featured above and another Bach bugle designed at Mt Vernon in 1956.Â The bell logo (not shown) indicates that the bugle is an Apollo bugle made in New York.Â The bell stamp has a #37 stamped on it indicating that it uses a #37 bell.Â This bell was not introduced until the late 1930s.Â All indications are that the bugle was made in the late 1940s in the Bronx, albeit possibly using a pre-1933 tuning slide. This bugle has been refurbished and refinished in satin silver plate.Â The bell front is normal silver plate.Â In its present condition, it is a striking bugle.Â Originally, it was finished in lacquer or raw brass. While the authors do not think that this bugle was designed for serial production, it is not exactly a prototype either.Â (Bach clearly stamped prototypes so they could be identified. )Â This bugle is more likely a one-of-a-kind item made at the request of a customer.Â It is historically important in that it features components used on late Bach bugles, e.g., the bell and mouthpiece receiver.Â It shows that Bach continued to give some thought to bugle design although he did not quite know how to penetrate the bugle market. Bach did make some more bugles, and they were important ones.Â They were made for the U.S. Army and will be discussed in Part Two of this article. Over the past few years, the authors had the privilege of meeting and communicating with Hans Vincent Bach (Hans Bach’s son and Vincent Bach’s nephew) and members of Hans’ family. Â Their insights and loans of instruments have been invaluable.Â Not only have the authors been able to examine some of Bach’s more interesting instruments such as the bugles featured in this article, but they also have been privileged to hear stories about “Uncle Vincent” and his relationship to his family.Â Uncle Vincent was the head of the American branch of the Bach family, and he took his role seriously.Â Making sure that his daughter and each of his great nieces and nephews had Bach instruments to play was just part of his assumed duties.Â All of the children got bugles.Â When some of the boys wanted to play trumpet, they got trumpets too, but they had to turn in their bugles to Uncle Vincent. The authors got significant help in preparing this article from MSGT Jari Villaneuva, United States Air Force Band.Â Jari is quite likely the foremost authority in the country on ceremonial bugles and their use.Â He owns an extensive collection of bugles and bugle-related memorabilia.Â He provided many hours of consultation to the authors, often by providing examples from his collection.Â If the authors made historical mistakes in this article, it was not from a lack of effort on Jari’s part. The authors greatly benefited from conversations with Dr. Raphael Osheroff, one of the authors of Reference 3.Â Ray is among the foremost authorities on the American drum and bugle corps movement.Â Before talking to Ray, the authors had little idea about the extent of this movement and its importance. Michael Corrigan, the owner of Apollo bugle #355, graciously loaned his bugle to the authors so it could be compared to the bugles featured in this article.Â His bugle provided significant insights into the construction of the Apollo bugles.Â Michael owns a brass repair company located in Kansas City, Kansas. In addition, this paper was written through significant support from Conn-Selmer, Inc. of Elkhart, Indiana.Â Access to their data was essential to understanding Bach’s bugles.Â The most notable information came from a special folder Bach kept on his bugle designs.Â The folder had been missing since the Selmer Company moved Bach manufacturing to Elkhart Indiana in 1964.Â Through some miracle, the folder survived.Â During a search for it with one of the authors, Mr. Tedd Waggoner, Conn-Selmer’s Marketing Manager of Brass Winds, found it in an obscure file cabinet.Â The authors were allowed complete access to the material contained in it.